This time, I will tell the sad story – with a happy ending, though – of a student who was working for a colleague of mine. The student's task was to edit a Word document that my colleague had sent him by e-mail. I took only notice of this when the student, who sat in my room, asked me to help him and find out, together with him, where his Word document had gone that he had edited all day long. "Hmm," I said, "how should I know where you stored your file? What did you do with it?" He told me that he had opened the e-mail attachment in Word, edited it there, and saved it several times using the Save command. Now, at the end of the day, he had saved his work once more and had quit the application. And all of a sudden, he was wondering where the file had been stored on the computer. "Hmm," I said again, "usually, I do it in a different way: I save a local copy on my computer, so I always know where my file is." This was indeed a situation that I never had encountered before – and as I am more familiar with the Macintosh than with Windows, I had no clue what Windows had been doing. Fighting with an upcoming feeling of despair, the student went next door and asked my colleague for help. Being a proficient Windows user, he brought in the idea that the file might be stored somewhere among the temporary files. But where are these located on the computer? My colleague suggested starting a search for the file based on its name. Such a search may take quite a while, and I also suspected that the temporary file might be stored under some cryptic name (we might have used the "Date modified" info...). Anyway, while the two started a search, I tried a "parallel experiment," looked for an e-mail with a Word attachment, loaded it, and instead of the Save command used the Save As... command in order to find out where Word would save the document. I found out that Word would save it in my user area in the Local Setting folder, there in the Temporary Internet Files folder, and finally in a folder with a cryptic name. Armed with this news, I came back to the two. They tried the same with the attached document, that is, the original version of the document. Word would again save it in an analog location in a folder with another cryptic name. First, the two could not find that folder, so I left them again in order not to confuse them too much... But after a short while, I heard signs of relief: They had found the file, and the day was saved (see the solution). After the incident, I pondered the case. I asked myself why things could have happened as they did and which measures were at our disposal to prevent the problem or recover from it. First, I had hoped that the "recent files" list in the File menu would offer help: The temporary file was listed there two times but we were unable to retrieve it. Whenever we selected a version of the file, a conversion popup appeared but the conversion failed – and why should a conversion popup appear at all??? Second, I had the suspicion that Word might have warned the student when he stored the file but that he simply had ignored the warning, as we do often. I checked my suspicion the following day and found out that NO warning appears when the file is stored with the Save command. So, if the student had a wrong mental model of what was going on, he would not be given any reason for changing that model – only "after the fact," that is, too late. One might, of course, argue that the student had no clue at all of what he was doing and what was going on in the computer – but that's also a kind of mental model... This model is fairly common, as my wife confirmed when I told her the story. She wouldn't have had a clue either, and many others as well... Probably, the student simply assumed that the computer would take care of everything – and was miserably disappointed by the system in the end. Is it the student who obviously had the wrong mental model of what he was doing? Is it the developers of Microsoft Word (and other Office applications), who failed to issue a warning to users when they save a file, which resides only in computer memory, to a temporary location? I would say, it's the latter. We perform many tasks without a clue of what is "really" going on and muddle our ways through. Good design should support such behavior because our environment is already far too complex for having a clue of everything. To sum up, in this story, a simple popup would have minimized the chance of a disaster to almost zero. 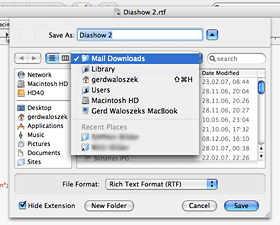 Use the Save As... command first – in the dialog you will see the folder. However, you will not see the folder in the Explorer – that's the reason why the two did not find the folder initially (the Find command does not see it either...). 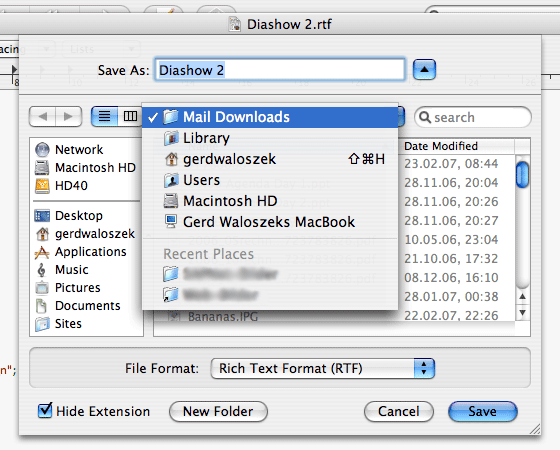 Then use the Open command – and you will see the folder and therein the file. Voila! Use the Save As... command. In the upcoming file list, you will find the file residing in a folder with a cryptic name. 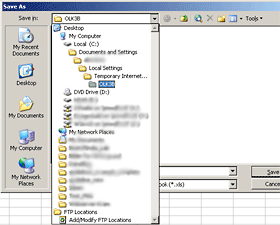 Select the file in the list and copy it using the context menu (or Ctrl-C). Important: Cancel the Save As... command in order not to overwrite your edited version with the currently loaded one. 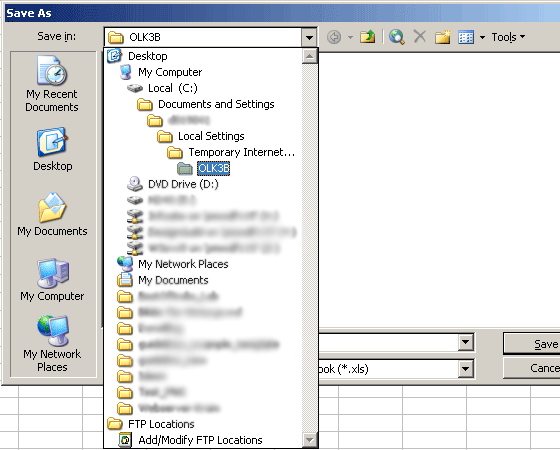 Switch to the Explorer and paste the file to a location of your choice. Voila! When I tried to replicate the behavior described in this article the next day, I was struck by surprise: When I saved the edited attachment, a Word document, using the Save command, the Save As... dialog appeared. After some experimentation, I found out that the read-only flag was set and caused this behavior. Thus, as a preventive measure, you should set this flag before sending a document as attachment.